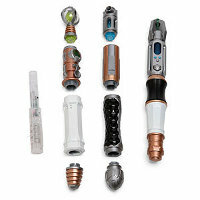 For the DIY enthusiast who loves conjuring his own contraptions during one’s free time, here is the $39.99 Doctor Who Build Your Own Sonic Screwdriver that says it all. You, being the 12th doctor, will need to build your very own tool. With more than 80 different combinations, you can even select your choice of lights and sounds to make it a truly personalized experience. After all, I would say that for a Doctor to build his own Sonic Screwdriver is somewhat akin to the rite of passage that all Jedi padawans go through, when they are required to construct their own lightsabers. This is definitely for the true blue Doctor Who fan in the house, get it for someone who does not watch or follow the series, and you will most probably be on the receiving end of a really strange look, wondering why you could not have spent such money in a wiser manner.